In 1788 a letter of benefaction was received by the Provost and Fellows of King’s from Patna in India. A Kingsman by the name of Edward Ephraim Pote (1750-1832) was announcing that he had ‘acquired a collection of Persian Manuscripts amounting to more than five hundred and fifty volumes’ and was arranging to have them shipped to England to be divided between the colleges of King’s and Eton. This, he said, was ‘to shew my gratitude to those Foundations to whose institutions I am indebted for my education’ (King’s College Archives: KCAC/6/2/23 or LIB/10.2). Our recent research confirms what has long been suspected, that the Pote manuscripts had formed the bulk of the collection of Colonel Antoine-Louis Polier (1741–1795). As Henry Bradshaw noted, Polier’s seal appears on a large number of the manuscripts and his autograph is on several of them. Polier was an officer and agent of the East India Company, assimilated into the Mughal Courts, and, later in his career, an orientalist, collector and patron of the arts in Lucknow. 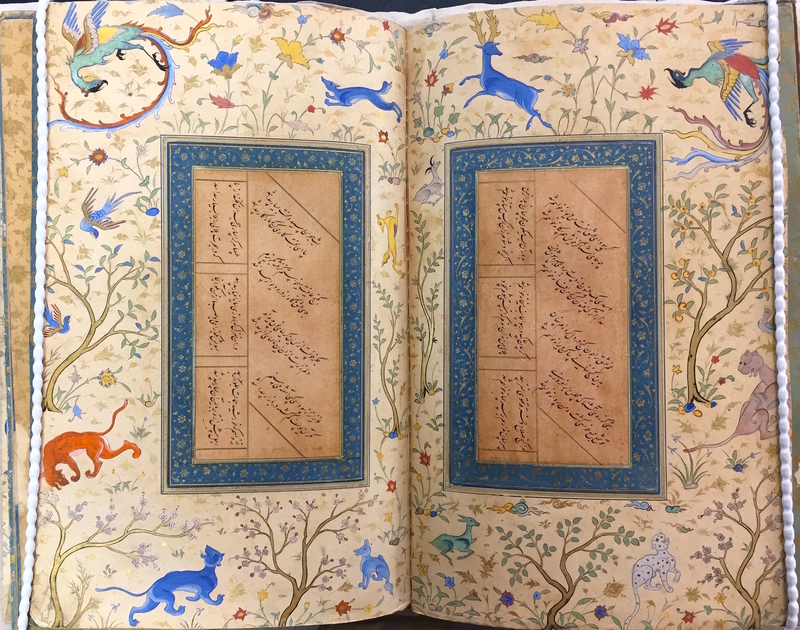 The collection is dominated by Persian manuscripts, but it also contains codices in Hindustani and Arabic. At the invitation of Professor Jean Michel Massing and with the support of the Apelles Art History Fund we have recently catalogued the half of the Pote Collection belonging to King’s and made the records globally accessible via the union catalogue of manuscripts in British collections from the Islamicate world known as Fihrist (www.Fihrist.org.uk). The Apelles Art History Fund was established by King’s in 2016 to support original research in the history of art at the College, patrimonial acquisitions and the restoration of art works owned by the College. It commemorates Professor Massing’s contribution to the field and encourages continued exploration and discovery in the arts. In the first years, one of the priorities of the Fund is research on the College’s works of art, including the Pote Collection of Islamic manuscripts and the Keynes Art Collection. To help raise awareness of the little-studied Pote Collection, this post introduces one of its highlights: King’s Pote MS 186. This manuscript, comprising a collection of poems, is a feast for the eyes: the lyrical verses are arranged in a calligraphic layout, penned by the famous ‘Royal Scribe’ (Kātib al-Sulṭānī) Mīr ‘Alī Haravī (flourished 915–951/1509–1544), framed by exquisitely decorated margins, and enclosed in a beautiful lacquer binding and doublures (inside bindings). 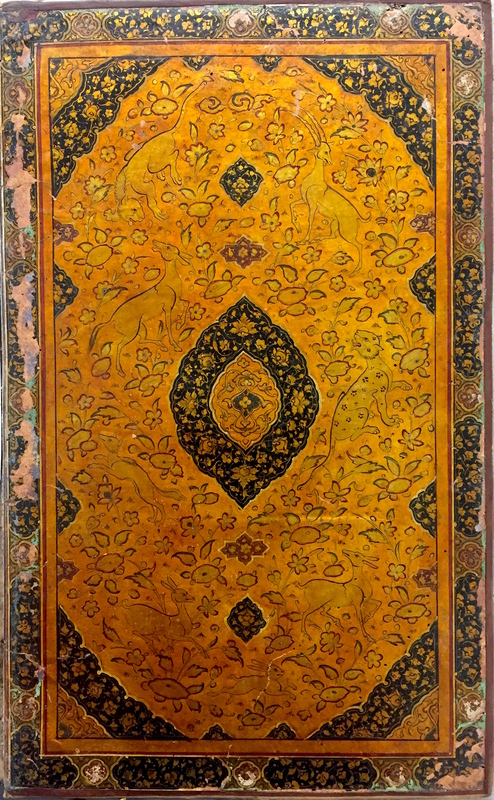 Left half of the double-page frontispiece, Dīvān of Hilālī, penned by Mīr ‘Alī Haravī, dated 938/1531-32 (King’s Pote MS 186). Each page consists of a central text block with a narrow illuminated border, mounted within a frame (passe-partout) decorated either with drawings of flora and/or fauna in gold or with multi-coloured paintings with charming depictions of animals. Based on the artistic style and type of paper, the remounting was very probably executed in Mughal India. Illuminated margins, floral decorations in gold (King’s Pote MS 186). Mīr ‘Alī was an acknowledged master of calligraphy, especially prominent in a script known as nastaʿlīq. He worked in Herat and was moved to Bukhara around 935/1528–29. 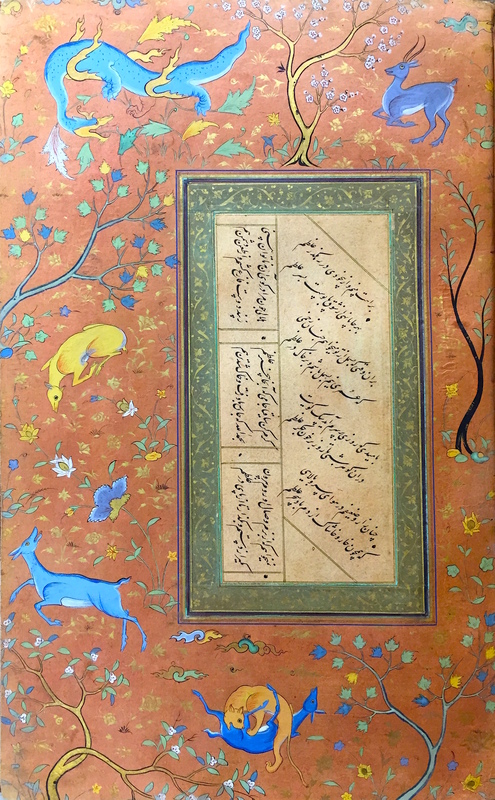 His calligraphy was much prized in later centuries, especially at the court of Shah Jahan in India, and it is probable that the manuscript was remounted and decorated (and rebound) at the latter’s command. 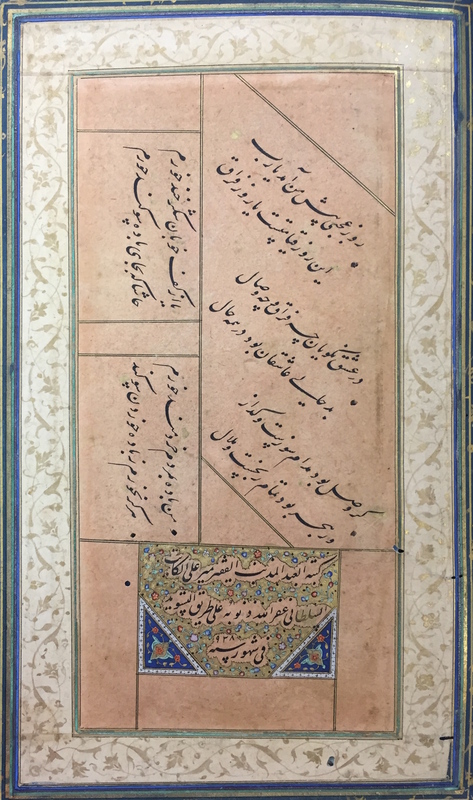 Although further research is required, there are signs the manuscript was once in Shah Jahan’s Royal Library: it bears an inspection note and the seal impression of ‘Abd al-Ḥaqq Amānat Khān, who might well be the calligrapher of that name (d. 1054–55/1644–45) who designed the calligraphy on the Taj Mahal, and whose seal impression appears in other manuscripts from the Mughal Royal Library. Lacquer binding showing fantastic landscape with dragon and simurgh (King’s Pote MS 186). 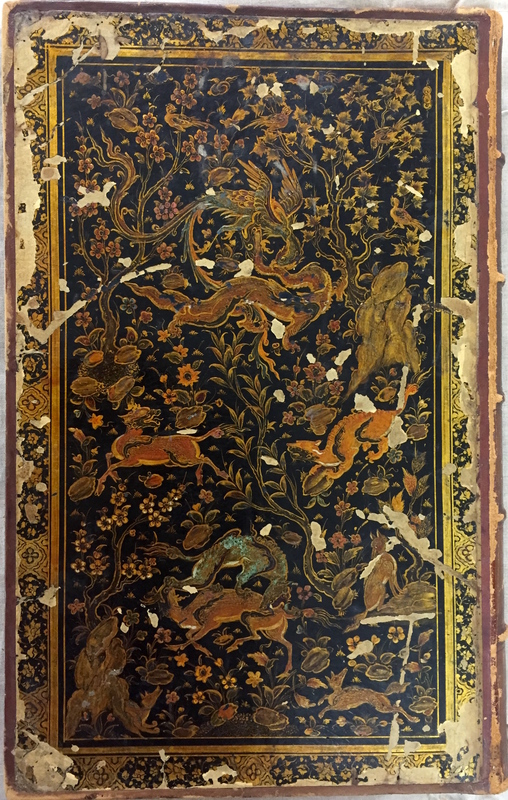 The manuscript has a lacquer-decorated binding depicting a hunt scene of fantastic and naturalistic animals, including a simurgh (a benevolent, mythical bird in Iranian mythology), a dragon, foxes, hares and birds of prey, all painted in glittering and bright colours on a blackground. The doublures, with a gold and ochre background, carry a diamond-shaped medallion (turanj) in black and gold, pendants in black and reddish brown, and corner pieces, all decorated with floral motifs. The ground depicts animals including a lion, a leopard, a fox, an antelope and a deer in a setting of sparse shrubs and flowers. The front and back covers and doublures are identical. The binding seems to be contemporary with the marginal illuminations and illustrations, and a product of the same Mughal royal atelier. Lacquer doublure (inside front binding, King’s Pote MS 186). Similar animals, in different poses, are illustrated among trees and flowers in some of the margins on both dark and light grounds. The palette used in these illustrations includes gold and a variety of vivid colours. 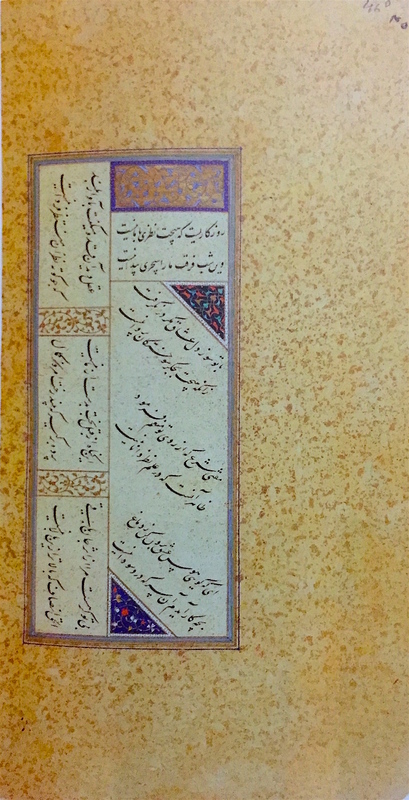 The textual content is a selection of lyrical poems (ghazals) by a prominent poet, Badr al-dīn Hilālī of Astarabad (d. 936/1529–30 or 939/1532–33). Hilālī had been in the literary circle of the Timurid Sultan Ḥusayn Bāyqarā (842–911/1438–1506) as a protégé of his bibliophile vizier, ‘Alīshīr Navā’ī (1441–1501), in Herat. 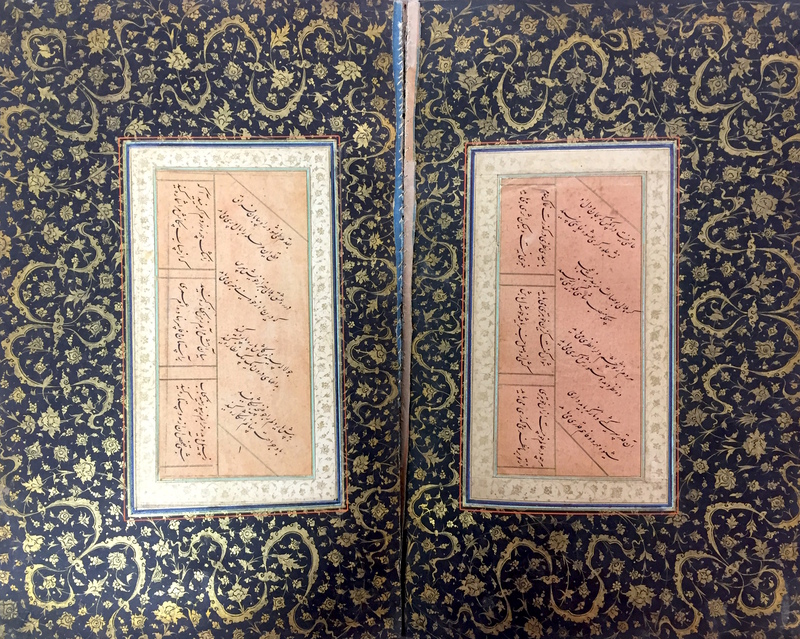 Our manuscript, completed in 938/1531–32, is the earliest copy of Hilālī’s poetry and the closest to his time. To my knowledge, the second oldest manuscript from the same poet is dated 957/1550 (now in the Tehran Majles Library), almost two decades later than the King’s manuscript. Our manuscript was penned by the most prominent calligrapher of the time, Mīr ‘Alī Haravī, the Royal Scribe. The borders were illuminated and illustrated under the Mughals. Although the poet’s date of death is a matter of debate, it is possible that this was copied before the poet was put to death for his religious beliefs, in which case he could have been involved in selecting his poems for this collection. Unfortunately, the first folio (right half of the double-page frontispiece), with the heading and title inscription, which could have contained some clues about the poet, has been lost and was replaced in the Mughal era (the first extant ghazal, i.e. a form of lyrical poem, begins partway through). We do not find any indication in the colophon that the poet had recently passed away. We know that the poet and the scribe were once companions at the court of the last Timurid Sultan in Herat in the late fifteenth- and early sixteenth-centuries, before both were moved to Bukhara to serve an Uzbek khan. Whether the poet was alive or not when the manuscript was penned is a question that requires further investigation. However, there is no doubt the textual content remains a significant early source for future editions of the ghazals of Hilālī’s dīvān. Signed by the scribe, Mīr ‘Alī al-Kātib al-Sulṭānī, the Royal Scribe (King’s Pote MS 186, colophon). There is a closely-related manuscript, which was also penned and compiled by Mīr ‘Alī Haravī, in 935/1529 in Bukhara (two to three years prior to our manuscript), and which contains a selection of poetry by eleven poets from the same courtly circle. That is MS C-860 which is housed in the Russian Academy of Sciences in St Petersburg, and comprises 56 folios with seven verses per page, arranged in a similar format to King’s Pote MS 186. In that anthology, the dimensions of the text panels are smaller and the margins are not illuminated or illustrated but simply gold speckled. However, it contains two subsequently added illustrations. 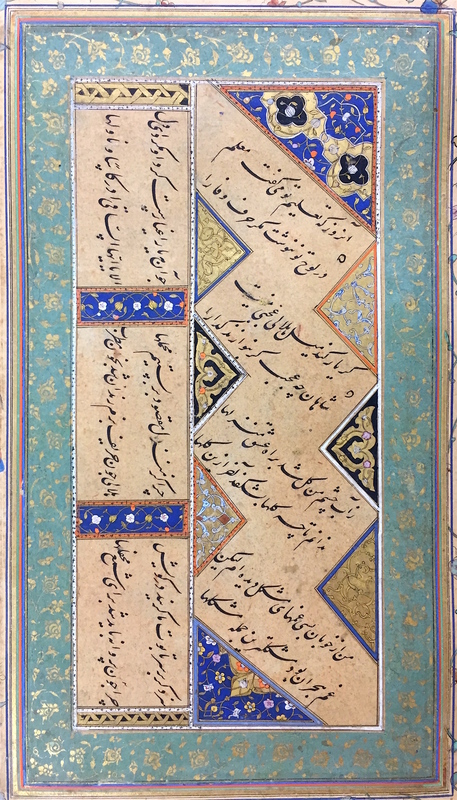 ‘Judging by the poem in the colophon, written by the author of the compilation [Mīr ‘Alī Haravī], the copy was intended for the Uzbek sovereign of Bukhara, the Shaibānid ‘Ubaid-Allāh Khān (died in 1533 [actually 1539]), an avid bibliophile.’ Based on the fact that the scribe Mīr ‘Alī Haravī was moved to Bukhara by ‘Ubayd-Allāh Khān (c. 935/1528–29) and the completion date of the King’s manuscript (938/1531–32), it is very likely that the patron of Hilālī’s dīvān was the same Shaybānid ruler ‘Ubayd-Allāh Khān. There is little doubt that the unnamed place where our manuscript was copied is again Bukhara. Poetry anthology, penned by Mīr ‘Alī Haravī, dated 935/1529 (MS C-860 in the Russian Academy of sciences, St Petersburg). King’s Pote MS 186 is the crowning jewel of the Pote collection at King’s. 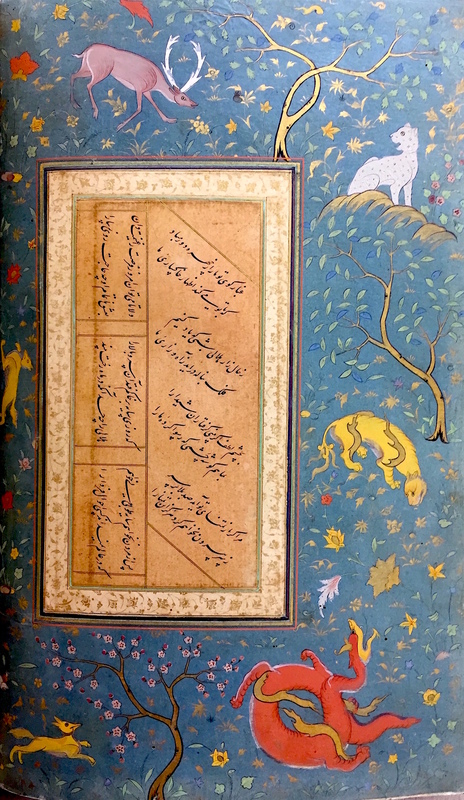 There is beauty in the masterful sixteenth-century penmanship from Bukhara, and in the exquisite decorated margins and binding that were probably added in a Mughal royal atelier around a century later. There is also great textual value in this early collection of verse by a noted contemporary poet. Of course, not all of Colonel Polier’s Lucknow manuscript collection was of this quality and value. But there are lesser treasures too, now in Cambridge, thanks to the efforts and generosity of Edward Pote. All manuscripts of the Pote Collection are on permanent loan at Cambridge University Library. O.F. Akimushkin listed a number of manuscripts in the hand of Mīr ‘Alī on p. 333 of his article on the Shaibānid library at Bukhara: ‘Biblioteka Shibanidov v Bukhare XVI veka’ in Bamberger Zentralasienstudien: Konferenzakten ESCAS IV, Bamberg 8-12. Oktober 1991, ed. I. Baldauf and M. Friederich (Berlin, 1994), pp. 325-41. See http://menadoc.bibliothek.uni-halle.de/iud/content/pageview/347600 . For more details and reproductions of the manuscript, see Y. A. Petrosan et al. Pages of Perfection: Islamic paintings and calligraphy from the Russian Academy of Sciences, St. Petersburg (Lugano, 1995), pp. 226–29. For information on the Shaybānids (or Abū al-Khayrids) see http://www.iranicaonline.org/articles/abul-khayrids-dynasty. For Bukhara see http://www.iranicaonline.org/articles/bukhara-viii.